Too many people who have conventional dentures don’t like to wear them because they don’t stay in place. 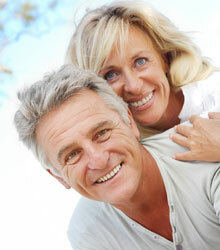 Teeth Xpress offers a way to keep dentures secure and allows you to go about your daily life with confidence. During the procedure, 4 to 6 implants are placed into the jaw with abutment posts. Your Denture is Then attached to the abutments. The Teeth Xpress procedure typically can be completed in one day and can be done under local anesthesia. Discomfort from Teeth Xpress is usually minor and temporary.